The West Plains High School cross country program, McCluer South Berkeley High School track and field program, and University of Central Missouri coaches Kip Janvrin and Kirk Pedersen will be among the 21 honorees inducted into the Missouri Sports Hall of Fame at a ceremony in Springfield on Sunday. Also being inducted is Mark Fisher, who was a successful high school basketball coach before becoming the Springfield Public Schools and is currently Drury University athletic director. Fisher also coached the Stanberry High Schools girls to a 1982 track and field state championship title.Two of the seven Sandbothe siblings from Washington, Robin and Lori went on to college basketball scholarships, but both were All-Stater performers for Washington High School. The Missouri Sports Hall of Fame (MSHOF) opened its facility doors in 1994 in Springfield, though its website says it's been honoring inductees since the first one was enshrined in 1951. 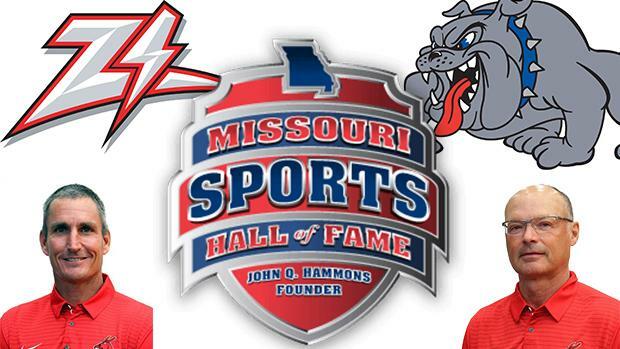 Every January the MSHOF holds an enshrinement ceremony in Springfield, and in recent years has added additional ceremonies around the state to honor individuals, teams, programs and businesses with Missouri connections that excelled, supported, and sponsored athletics. Sunday's activities include a morning reception at 11:00 a.m. at the Missouri Sports Hall of Fame, followed by a 4:00 p.m. reception at the University Plaza Hotel and Convention Center with Dinner and enshrinement ceremonies following right after at 5:00 p.m. Tickets had been sold out, but a waiting list was announced this week. The phone number for questions or inquiry is 417-889-3100. This class of inductees includes former professional athletes or coaches like Lafayette High School (Wildwood, MO. ), Missouri State University, and MLB baseball standout Ryan Howard, former Kansas City Royals and St. Louis Cardinals World Series winning pitcher Jeff Suppan, former Raymore-Peculiar, Mizzou, and NFL tight end Chase Coffman, former Kansas City Chiefs receiver Carlos Carson, former Joplin Parkwood High School and University of Tennessee football and baseball standout Alan Cockrell, who played and coached baseball in the major leagues. Other inductees include former Kansas City Chiefs Head Team Physician Cris Barnthouse, outdoor conservation ambassador and outdoor media production company Drury Outdoors, The Sandbothe Family of Washington that includes seven siblings who earned college athletic scholarships, shotgun sports champion Troy Major, golfer Joyce Mahoney, former Harrisonville High and University of Kansas quarterback Kelly Donohoe who has coached Blue Spring High School to seven state football championship games and four state titles, former West Plains, Hartville, and Ozark High School boys basketball coach Steve Hunter, Jefferson City/Columbia market's CBS affiliate KRCG TV Sports Director Rod Smith, and senior triathlon champion Ray Wageman will be honored posthumously. Also being honored is the Heart of America Beverage Company with the Founders Award and entrepreneur and developer Bryan Magers with the President's Award.